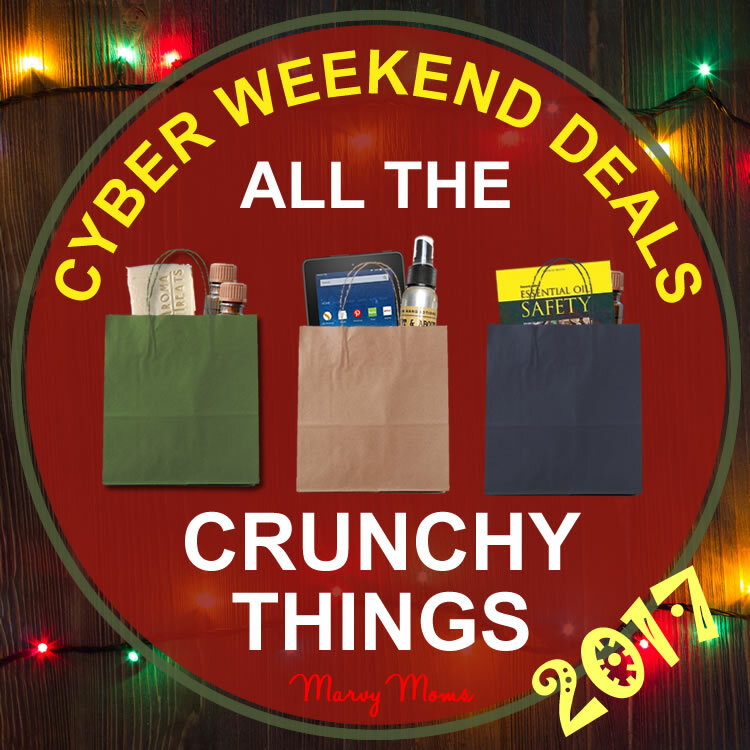 This is the third year of Marvy Moms Black Friday Sales on All the Crunchy Things. This is your chance to shop from your comfort of your home or wherever you happen to be with your mobile device. There should be something here for you whether it’s to feed your essential oil habit or to save some money on your new (or old) crunchy lifestyle. This post will be updated with new sales as I find them so be sure to keep coming back for more! Each sale listed has a finite time, some have codes, and some require you to take another action (like adding a product to your cart). Some sales are on Thanksgiving Day only (a day before Black Friday) and some are after black Friday (all the way through to Cyber Monday and beyond). Make sure you follow these guidelines to get the sales. Most companies have more information/restrictions on their site. Happy shopping and be sure to let me know what you get and how much you save! I ordered two of these and an an Echo Second Generation to make my home a smart home and so I will no longer have to carry one speaker around the house to listen to music. Now is the perfect time to join Amazon Prime! With a free 30-day trial you can get all of your holiday gifts shipped to you for free. Then listen to Amazon Music and watch videos on Amazon Instant Video for free on your new Echo device! Get a Free 30-day Trial of Amazon Prime! Get the Echo at Amazon! Get the Echo Dot at Amazon! The Complete Guide To Clinical Aromatherapy and Essential Oils of The Physical Body: Essential Oils for Beginners by Elizabeth Ashley. Always FREE Kindle edition. Rose – Goddess Medicine: The Timeless Elixir of Ancient Egypt, Ayurveda, Chinese Medicine, Essential Oils and Modern Medicine by Elizabeth Ashley: FREE Kindle edition throughout Black Friday. My favorite Amazon deal of the year! Get $5 off print book purchase over $20 with code GIFTBOOK17. Might I suggest a good book? Essential Oil Safety: A Guide for Health Care Professionals-, 2e by Robert Tisserand and Rodney Young: Current price for the hardcover edition is only $86.02 (down from $99.95). With the coupon, you’ll pay less than $50! Clinical Aromatherapy: Essential Oils in Healthcare, 3e by Jane Buckle: Under $35 after discount! Complementary Nursing in End of Life Care – Integrative care in Palliative Care by Madeleine Kerkhof-Knapp Hayes: Great deal on this beautiful new book full of aromatherapy ideas that goes way beyond what the title would indicate. Medical Herbalism: The Science and Practice of Herbal Medicine by David Hoffman: I got this book last year with a Black Friday Deal. Which book are you going to get with this deal? Get your next book at Amazon for $5 off! Until November 27th, Amrita Aromatherapy is giving all retail customers a 45% discount on all products. This offer includes all consumer-size products: Essential Oils, Tri-Essence and Synergy Blends, Roll-ons, Perfumes, Beauty Products and more up to 8 oz. Free shipping on orders over $50 (before sale price)! Enter coupon code SAVEBF at checkout. Get the deal at Amrita! Kelly Holland Azzaro is the aromatherapist that runs the only animal aromatherapy Facebook group that I recommend. 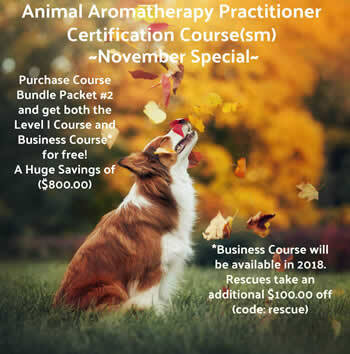 She offers essential Animal Aromatherapy Practitioner Certification Course (sm) November Special Offer (Big Savings prior to new site launch!). Purchase the Bundle Packet #2 (currently on sale) and receive both the Level I Course ($400.00 value) and the upcoming Aromatherapy Business & Professional Ethics for Animal Aromatherapists(sm)* ($400.00 value) for FREE!!! This course offers over 300 hours in educational training including A&P. Course modules are emailed to the student and students can email Kelly directly with questions pertaining to course materials and for mentorship support. Existing students will be added to the new online school once it is launched. If you have been wanting to take this course, now is the time, as once the online school is launched, prices will go up. *The Business course will be available in 2018. Here is the link to purchase the Course Bundle Packet #2 (note: link may not work with some iPhones or tablets, but does with PCs). Please email Kelly to let me know you have purchased via this special offer (ashitherapy@skybest.com). Rescues and people who work with rescues get an additional $100.00 with discount code: rescue. Get the deal at Animal Aromatherapy! Appalachian Valley has had an ongoing sale that will continue until Saturday December 10, 2016. As always, there is free standard shipping on orders over $35 being shipped within the United States. Almost all products are available in sample sizes and Appalachian Valley offers up to three of their 75¢ samples for free. Discount will be applied in the shopping cart. Shopping Tip at Appalachian Valley: Create an account and sign in before shopping. By doing so, anything you put in your cart will be remembered when you return another time. You will also see more sizes available with pricing than before logging in. Get the deal at Appalachian Valley Natural Products! This is the official store of the American College of Healthcare Sciences and anyone can purchase products from this site. I got some great deals on books here last Black Friday and I’m excited to see that they have a sale again! Get 20% off your purchase of regularly priced items on Black Friday 11/24/17. Use code BLACK17. Get the deal from the Apothecary Shoppe! Owned by a certified aromatherapist, formulator, and aromatherapy student, AromaBoxTM provides curated boxes highlighting small businesses. Use coupon code BlackFriday to get 10% off their retail box (which is already a huge savings) or lavender salted milk bath. Get the deal from the AromaBoxTM! Teri Leigh Baird is a certified aromatherapist and the genius behind the soaps and other aromatherapy products at AromaTreats. My friend and fellow aromatherapist, Robin Kessler, uses Teri’s soap and says, “Her soaps are wonderful, makes my face feel soft and smooth. 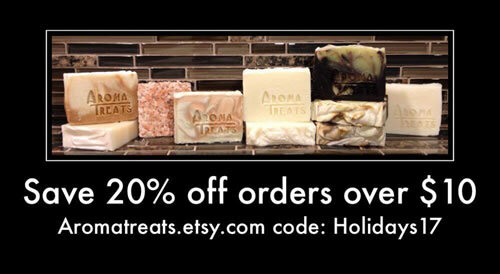 The soap is huge and lasts a very long time.” Get 20% off your Aroma Treats purchase of $10 or more until the last day of 2017. Use code Holidays17 at checkout. Get the deal at AromaTreats! 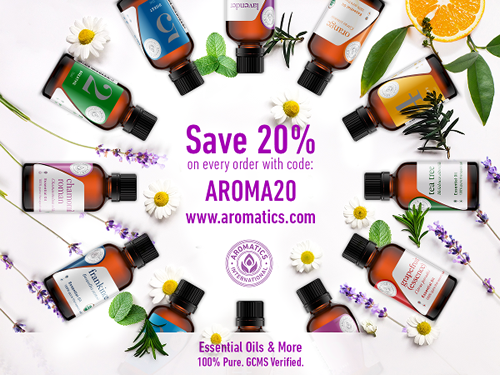 Get 20% off your order with code AROMA20. Good through Monday 11/27/17. Plus Aromatics now offers everyday Free Shipping for orders over $50. Get the deal at Aromatics International! Atlantic Institute is owned by vintage aromatherapist, Sylla Sheppard-Hanger. Get 20% off all books and courses. Some are the lowest prices they’ve been all year. Sale is on until Monday at Midnight. 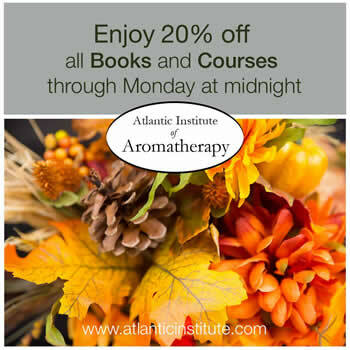 Get the deal at Atlantic Institute of Aromatherapy! Get 20% off your online order with code GIVETHANKS and/or get 25% off any one item of your choice with code T7W4N7V (some restrictions apply). Only one coupon can be applied per order. Offers good through 11/26/16. In addition, you can also use the code to buy one additional book in the store. Plus, spend $25 and get free shipping. What aromatherapy, homeopathy, or herbal medicine book will you buy? Get the deal at Barnes & Noble! FREE Shipping with NO minimums for the first three individuals who use this code: BlackFridayNMFS. Valid for USPS Priority Mail shipping ONLY. Cannot be combined with other sales, discounts, or orders (available Thursday midnight through midnight on Black Friday only ). FREE Shipping with a minimum of $30 purchase from 8AM to 3PM. Use code: BFFreeShip30. Valid for USPS Priority Mail shipping ONLY. Cannot be combined with other sales, discounts, or orders (available Black Friday only from 8AM to 3PM). 24% Discount on everything in our Essential Oil Gift Sets & Kits collection. Use code: BlackFriday24. Cannot be combined with other sales, discounts, or orders (available Black Friday only). 14% Discount on everything in the store! Use code: BF14ALL Cannot be combined with other sales, discounts, or orders(available Black Friday only). For the entire weekend, you can save up to 10% off everything on the website. Use code: SmallBizTY Cannot be combined with other sales, discounts, offers or orders. Enjoy 25% off our citrus essential oils! This includes Bergamot (FCF free), Grapefruit, Lemon, Lime, Mandarin, and Orange. Use code: CyberCitrus Cannot be combined with other sales, discounts, offers or orders. Enjoy 18% off everything on the website. Use code: Cyber18 Cannot be combined with other sales, discounts, offers or orders. Get the last of your holiday shopping finished before the postal service shipping deadlines and save on shipping! Enjoy FREE shipping with your minimum purchase of $50! Use code: Cyber50 Cannot be combined with other sales, discounts, offers or orders. Valid for USPS Priority Mail shipping ONLY. Get the deal at Be Kind Botanicals! Although I have never tried her blends, I hear talk of them all over Facebook. Word is that Ruth Nelson makes some amazing blends and they are worth every penny. From 11/23/2017 – 11/27/2017, take 20% off the entire website!! Use code BF2017 at checkout. Only one coupon code can be entered per order. Get the deal at Ruth Nelson! Get $10.00 off any order, over $35.00 use code 10free ($10.00 off code can only be used 1 time per person. ), 16% Off any order using code 16jolly or 18% Off orders over $599.00 using code 18jolly. 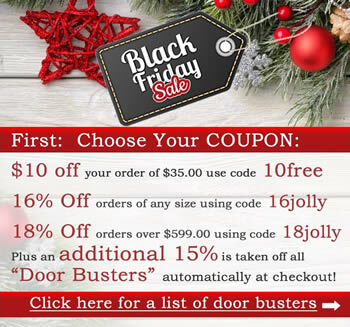 An additional 15% discount will automatically be applied to any door buster item in your cart! Get the deal at Bulk Apothecary! 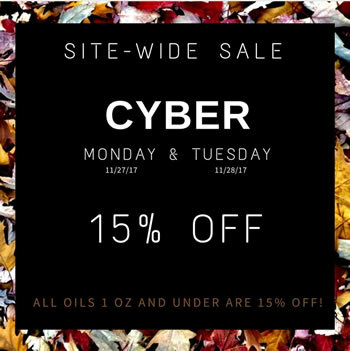 15% Off all Oils 1 oz and under Monday 11/27 and Tuesday 11/27. No coupon code necessary. Lots of great unique oils at Eden Botanicals. Fun to explore for something new! Get the deal at Eden Botanicals! I have no idea what their essential oils are like, however, they do have a ton of raw materials for perfumers and formulators. I have heard good things about their simple lotion. 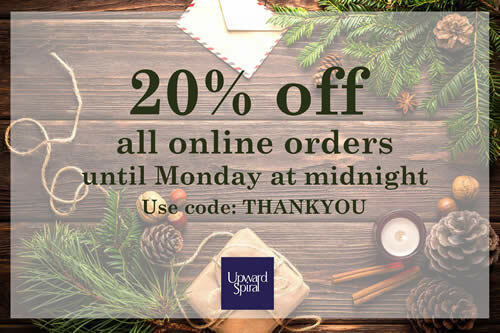 Save 20% any single order! Use code 2017NOV until 11/27/17. Get the deal at Essential Wholesale & Labs! Browse Floracopeia to find several products and courses on sale throughout the site. Get the deal at Floracopeia! Owned by Ryan Bambrick, Frankincese.net is a seller of fine frankincense resins, essential oils, and herbs. He’s put together deals on several products. Browse his site to find them! Gritman is offering 20% off everything in the store (except classes). Don’t let the name of the sale fool you! Sale runs Friday 11/24 to Monday 11/27/17. Get the deal at Gritman! Groupon always has a ton of deals on diffuser and other aromatherapy products. Although I can’t speak to the quality of the essential oils offered on Groupon (some of the companies I’ve never heard of), there is a huge diffuser selection. Get the deal at Groupon! The Herbal Guy has 20% off all products. Use code thanks17, plus free shipping on orders over $40. Sale ends November 27, 2017. Get the deal at The Herbal Guy! I am not much for incense, but the incense I have smelled from Higher Mind is gorgeous! Owner, Evan Silver Tree, offers a comprehensive course on how to use incense. Sign up for the waiting list to be notified the next time it is offered. Give the warming gift of incense to your loved ones this season and save 25% Off your entire order! Use the coupon code HOLYSMOKE at checkout at and get your discount on your Winter incense stock-up! Get the deal at The Higher Mind Incense! I really don’t know anything about their essential oils, but I did buy elderberries from them once when everyone else was out of stock. They are offering 20% off your entire order the week of Thanksgiving with code 1711 at checkout. Sale good through 11/27/17. Get the deal from Monterey Bay Spice Company! All during the Thanksgiving Weekend, from Thursday though Monday night, use promo code GRATITUDE and and receive 20% off all retail products. Books, kits, bulk products excluded. Black Friday, November 24. Use the discount code No-Mall for 15% savings on all retail sized products, oils, blends, hydrosols, carriers, accessories, etc. No bulk products, no kits, no books. Also… FREE (domestic) shipping on orders over $50.00. (We never combine free shipping and other discounts, but.. we want you to avoid the mall!) Please note, our shopping cart will NOT allow both free shipping and a discount code. You will be charged shipping. We will manually go back and refund the shipping charges for all orders with a value of over $50. I know how I will spend this Saturday! Cyber Monday, November 27. Use the discount code CYBER and finish off your holiday shopping by saving 12% on every product we offer, except gift certificates. Had your eye on a special book? on one of our kits? Want to buy a bulk essential oil or hydrosol? this is your chance to save. Please remember that we can’t combine discounts, and over this frantically busy weekend we will not be able to make any changes or additions to your order. The order you submit will be the order we ship. If you want to request samples please make sure you request them in the comments section at checkout. Emailed requests can not be honored. Another reminder. Our shopping cart and server are on CENTRAL standard time, If you wait until almost midnight on the west coast, you will be too late, and the computer will reject your discount code. Computers are like that. Get the deals at Nature’s Gift! Tons of classes on aromachemistry, herbal medicine, etc.. by naturopath, Timothy Miller. Take 25% off through midnight PST Sunday, 11/26/17. Use coupon code BLACKFRIDAY25 at checkout. Get the deal from Natropathic CE! Owned by certified aromatherapist Ginger Moore, Neos Skin Care is having their nnual 12 Days of Thanks Customer Appreciation Event. Use THANKS2017 at checkout to get 30% off sitewide (excludes gift certificates). Also Like and watch the Facebook fan page for fun surprises that may pop up during the sale. Get the deal from Neos Skin Care! Oilistic Aromatherapy is owned by Certified Clinical Aromatherapist, Cynthia Tam. She will be offering different deals for Black Friday, Shop Small Saturday, and Cyber Monday. Follow her page on Facebook to see the latest deals. Get the deal at Oilistic Aromatherapy! Get the deal at On Hand Lotions! This company is owned by Kurt Schnaubelt, author of The Healing Intelligence of Essential Oils: The Science of Advanced Aromatherapy, Advanced Aromatherapy: The Science of Essential Oil Therapy, and Medical Aromatherapy: Healing with Essential Oils. He is a well respected member of the aromatherapy community. Get 20% off everything in the store while supplies last (quantities are limited on several products). Discount is automatically applied in the shopping cart. Sale is Wednesday Nov 22nd through Monday Nov 28th or while supplies last. Get the deal at Original Swiss Aromatics! Great source for herbs to make your tinctures and salves! While I do not see any specific Black Friday deals, they do have a few items on sale and For a Limited Time, get FREE Regular Delivery on every order over $35. Use promo code #FRSHP35 at Checkout! Get the deal from Penn Herb Company! Black Friday is the kickoff for Plant Therapy’s 25 Days of Christmas sale with $10 your order of $30 or more. Check back every day to see more deals as they are revealed. Get the deal from Plant Therapy! Pompeii Organics has a nice selection of essential oils, hydrosols, and aromatherapy accessories. Many of their oils are organic and all have GC/MS reports available right in the product descriptions on the website. Get 20% off November 24-27, 2017 with coupon code: HOLIDAY20. Free shipping on orders over $75. 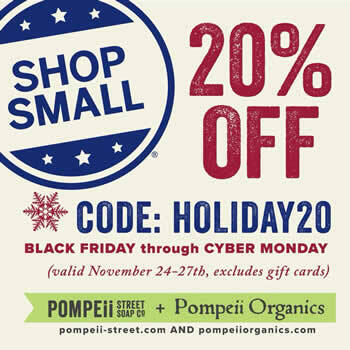 Get the deal at Pompeii Organics! For a limited time, my good friend and fellow aromatherapist, Robin Kessler, is waiving her consultation fee! Get a customized aromatherapy product for only the cost of the product. This is a super deal as Robin is an amazing aromatherapist! Fill out a client intake form by Monday 11/27/16 to get the deal and Robin will be in touch soon! Get the deal at RBK Aromatherapy! Rocky Mountain Oils (RMO) has a S.A.A.F.E. Promise that stands for Satisfaction Guarantee, Authentic, Analysis, Free of Adulterates, and Effective and Pure. In addition, they now stamp every bottle of essential oil with a batch number that you can enter on their website for a full GC/MS report. Door Busters! While Supplies Last! Buy One Defend Get One Defend FREE! Spend $249 also receive a FREE Tohi Wellness Kit! This means if you spend $249 (after discounts) you will receive up to an additional $227.29 value in FREE Gifts! This is HUGE! And, as always, there is free standard shipping within the United States. Get the deal at RMO! Samara Botane is discounting all of their essential oils, absolutes, CO2 extractions, extracts, alcohols, tinctures, concretes, floral waxes, oleoresins and essential oil collections, blends and synergies. Get the deal at Samara Botane! Get 15% off 5ml and 15ml essential oils and blends, all flower essences, and Bella’s shirt, too! use code TURKEY15 when you check out. (Sale excludes Rose, Helichrysum italicum Corsica, and both Agarwoods). Get the deal at Stillpoint Aromatics! 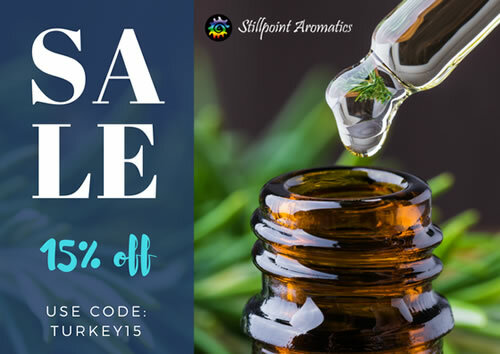 Experience essential oils from Sunrose Aromatics with a 15% discount on all orders over $50. Plus get free shipping on all orders over $75. Use coupon code SAVE2017 at checkout. Get the deal at Sunrose Aromatics! Owned by certified aromatherapist, Dedi Keenan Thorne, Terra Oleum is offering 20% off pure essential oils and blends, as well as pre-diluted essential oils (all clearly marked as such). Use coupon code BlackFriday. Includes free shipping. Get the deal at Terrae Oleum! Lots to order from this site, including essential oils from the French company, Florihana. Check their website for deals on certain products, including buy one get one specials on Gold Label Virgin Coconut Oil, Virgin Coconut Oil Moisturizing Lotions, Canadian Raw Honey, Maple Syrup, and Gold Label Virgin Coconut Oil for Hair Treatment. Free shipping (including frozen products) with code Thanks2017. Offer good until Sunday November 26th. Get the deal at Tropical Traditions! This is a great online used bookstore and I’ve bought some great homeopathy and herbal medicine books from them. Shipping within the United States is always free for orders over $10. Use my link and get 15% off your first order using code 3B545158B. Get the deal at Thriftbooks! Marvy Moms readers get a free 2 months membership plus 25% off your first order! Shipping is always free on orders over $49. Plus, holiday doorbusters of up to 70% off! But hurry, things are selling out fast! Get the deal at Thrive Market! Last year I wrote about my experience with Reiki Level I, II and Master Certification at Udemy, which is available for only $10 during the Black Friday sale. All Udemy courses are just $10 for Black Friday and you’re sure to find something you like. Use code 17HOLIDAY10 at checkout. Get the deal at Udemy! This one is not a cyber weekend deal, but instead starts December 1st and runs through the 23rd. Try Deborah Kallevig’s beautifully formulated skin care products at Unfussed with 20% off everything using coupon code Holiday17 at checkout. Owned by Nyssa Rhiannon Hanger, Upward Sprial sells single essential oils, essential oil blends, and essential oil accessories. Use code THANKYOU at in our store and get 20% off until Monday at midnight! Get the deal at Upward Sprial! Get 20% off your entire order (discount shown in shopping cart) plus Free Shipping for orders over $35. Sale goes until December 22nd. Get the deal at Vermont Soap! I know, I know! How is Walgreens crunchy? I use SheaMoisture soap for myself and the baby wash for my not-so-baby son with sensitive skin. Walgreens has great deals and I can only seem to find the products I like online anyway. For 3 days only you can get 25% off regular-priced items with code UNWRAP25. Plus, order now get FREE 1-3 day shipping at $35+ or FREE Ship to Store. Get the deal at Walgreens! New ointments are 15% off. No coupon code is needed and discount is applied in the shopping cart. Plus free shipping on all orders over $100. Get the deal at Washington Homeopathic Products! Wingsets is owned by Ann McIntire Wooledge who is a nurse, aromatherapist, herbalist, and soap maker. Fabulous aromatherapy blends, oils, soaps, and more! She makes botanically-based personal care products including a researched-based facial line and uses certified organic ingredients. Get 15% off your entire order starting Saturday 11/25 through Tuesday 11/28/17. Plus, get free shipping on orders over $75. Use code THANKFUL2017 at checkout. Get the deal at Wingsets! Happy Thanksgiving from Marvy Moms!